Forever critical of his own acting prowess, Forbes-Robertson’s career, spanning almost forty years from 1874 to 1913, is impossible to summarize in so brief a space. Born in London, he was regarded as one of the preeminent Shakespearean players in the four decades of his active life on the stage. His interpretation of Hamlet is regarded as one of the best of the twentieth century. 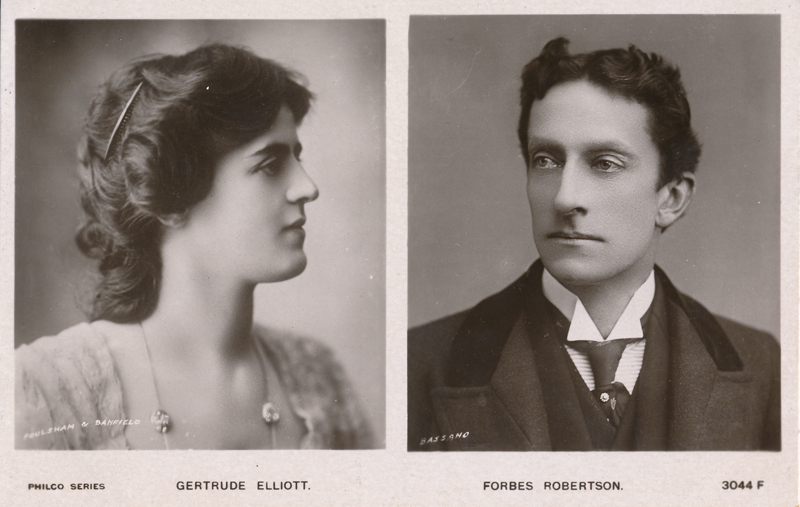 One of his younger eleven siblings was Norman Forbes-Robertson, also a noted Shakespearean, as was his sister-in-law, Maxine Elliott. 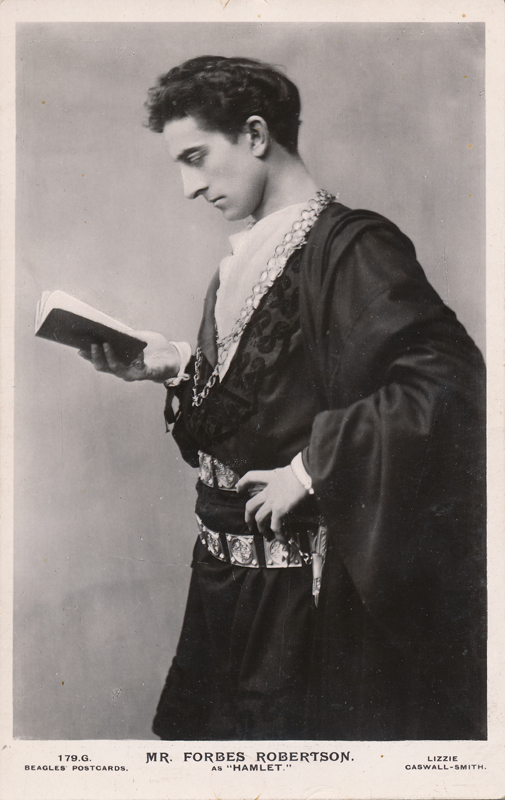 One of his early Shakespeare roles came when Wilson Barrett cast him as Romeo opposite Dame Helena Modjeska as Juliet. In 1882, he joined Herbert Beerbohm Tree’s company, and then next toured the United States with Mary Anderson. With her he made his New York City debut in 1885 as Orlando in As You Like It. 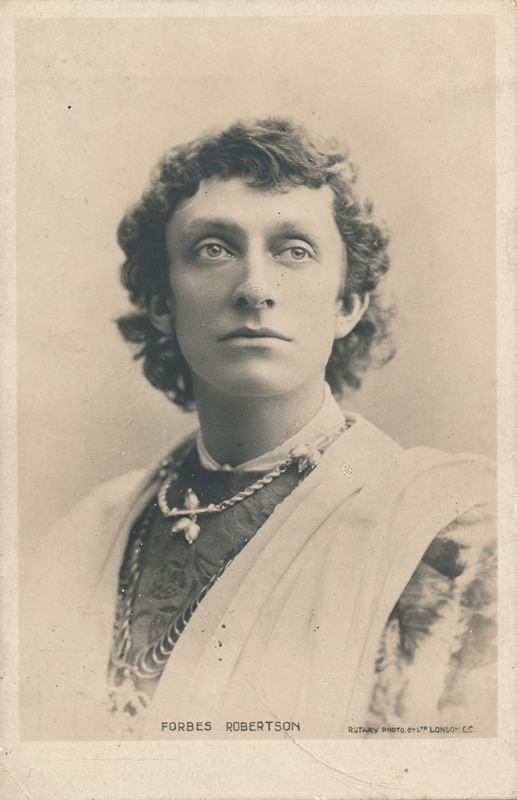 After touring in America with Mary Anderson and cementing his legacy by playing second leads to Sir Henry Irving, Forbes-Robertson returned to London in 1895, and as manager of the Lyceum Theatre played Romeo to Mrs. Patrick Campbell’s Juliet. It was at the Lyceum that he first played Hamlet, and he made a deep impression, proving to be one of the greatest Hamlets of his time. It is indeed doubtful if modern times have seen a better. He was also revered for his portrayals of Othello, Leontes (The Winter’s Tale), and Romeo. 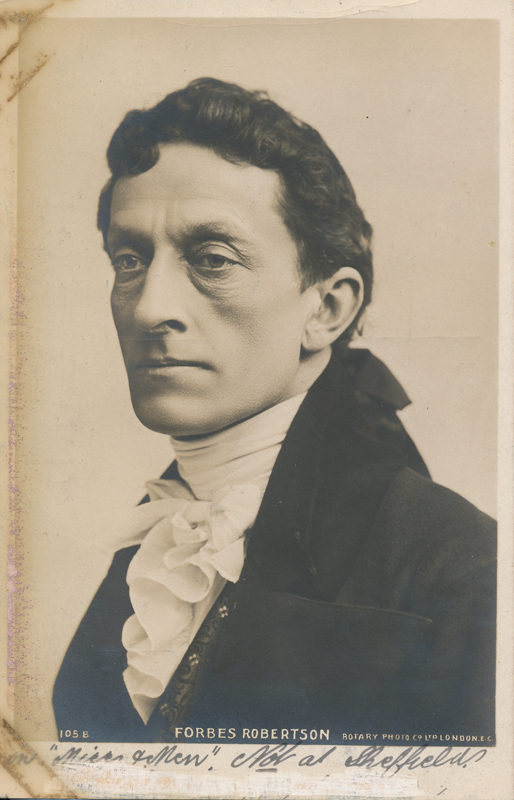 Forbes-Robertson had one of the finest voices ever heard on the stage, and was an actor of great sensibility and delicacy of imagination. 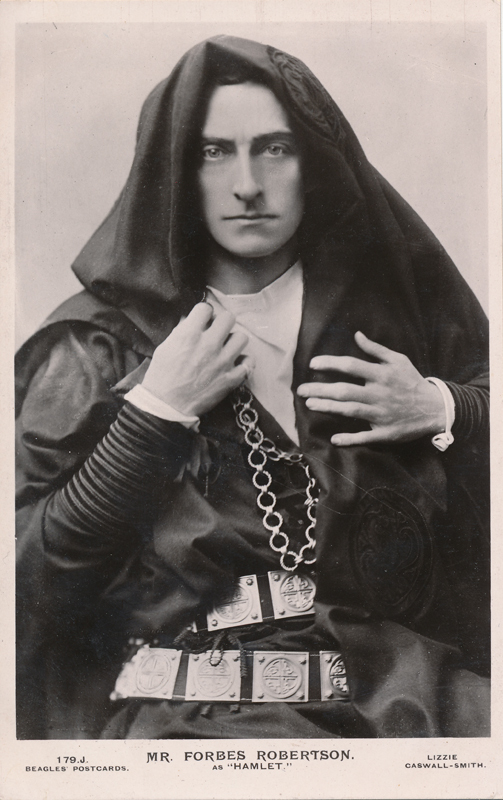 His ascetic fine-featured face made him a notable figure, while his repose, his power, and his understanding of his art placed him in the forefront of English actors (The Oxford Companion). Bernard Shaw, in 1898, was so impressed that he wrote the part of Caesar in Caesar & Cleopatra for him in particular. A few of these cards are here as well. He was also a member, like his brother Norman, of the London Garrick Club which holds a painting of his of actor-manager Samuel Phelps. He also wrote a biography of Phelps, his mentor. From youth, Forbes-Robertson had studied at the Royal Academy to become a painter, not an actor. After an unrequited love for Mary Anderson and a short affair with actress Beatrice Campbell, Forbes-Robertson married actress Gertrude Elliott, younger sister of the renowned Maxine, in 1900. He played with her as his leading lady until his retirement in 1913, the same year in which he played Hamlet with his wife as Ophelia in a film directed by Hay Plumb. In his touching and emotional farewell to the stage, he came down into the audience at the Drury Lane Theatre to bid them goodbye personally. During the last week of his formal retirement he was knighted. He published his autobiography, A Player Under Three Reigns, in 1925. He acted in his last film (he appeared in four) the year he died, 1937.